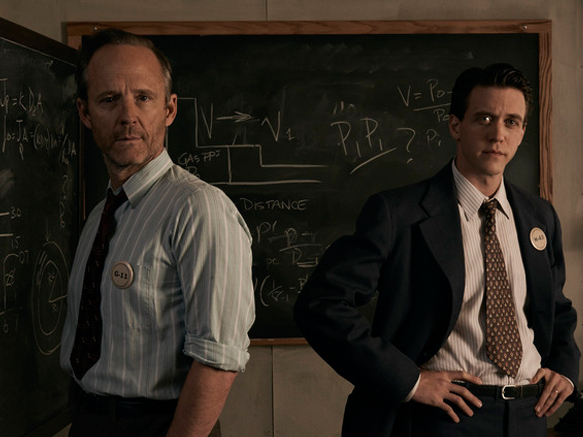 Frank Winter (John Benjamin Hickey) and Charlie Isaacs (Ashley Zuckerman), physicist protagonists of the WGN America television series “Manhattan”. Manhattan is a quality TV show about the people racing to build an atomic bomb and their families. It’s well worth watching, but you’ll enjoy it more if you remember you’re not tuned to the History Channel. Sometimes people say that a particular TV show is “the best thing you’re not watching”. With respect to Manhattan the second part of this is certainly true; the show’s ratings are pretty low, even in this age of niche shows and fragmented audiences. The first part I can’t definitively speak for, since I don’t watch a lot of TV, but in general I like Manhattan and definitely recommend you check it out—hence this blog post. 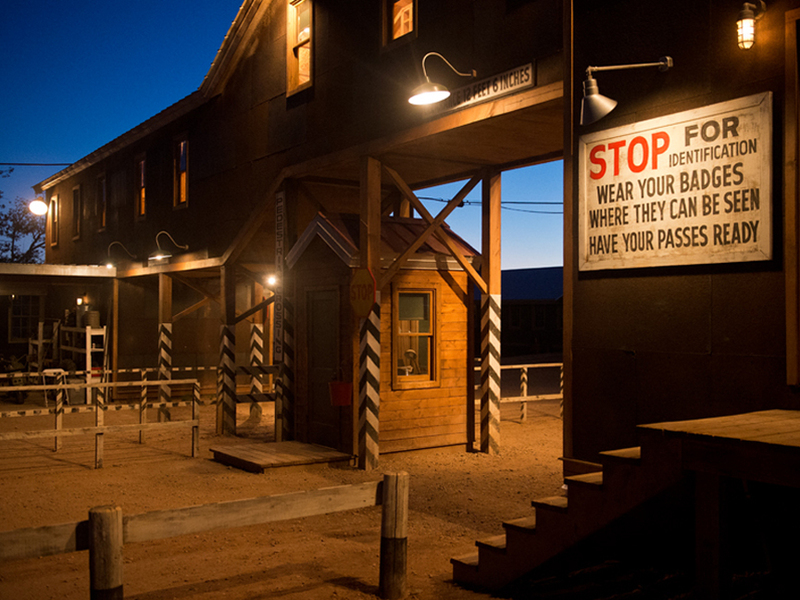 The entrance to the Los Alamos “tech area” on the WGN America television series “Manhattan”. It’s a pretty weighty premise for a TV show, and the scientific nature of a lot of the plot is a further barrier for prospective viewers just looking for an hour’s entertainment. (For example, one of the major plot points hinges on the fact that the element plutonium used in atomic weapons has multiple isotopes, one of which, P-240, undergoes spontaneous fission much more readily than the more common isotope P-239.2) The show is produced by the fledging network WGN America, apparently in an attempt to establish itself as a serious player in the “prestige television” market, similar to what Mad Men did for AMC. Unfortunately 1940s physicists are not as relatable to most people as 1960s advertising executives, which may help account the low ratings. When I started writing this post I didn’t know whether WGN America was willing to subsidize the show any further, and I thought I’d be writing an obituary rather than a recommendation. Happily WGNA recently decided to renew the show for a second season. So, why should you watch Manhattan? First, the historical and scientific background is genuinely interesting, especially for a former physics major like me but I think potentially for others as well. We all know how this show ends (with the destruction of Hiroshima and Nagasaki) but the path to working atomic weapons was long and fraught with difficulties—for a while it was unclear whether it was even possible to build a working bomb. Manhattan, like almost all TV shows and movies, takes some liberties with the actual scientific facts, but the core of the story is real, and the key problems that the protagonists face are the same problems that their real-life counterparts strove to overcome. 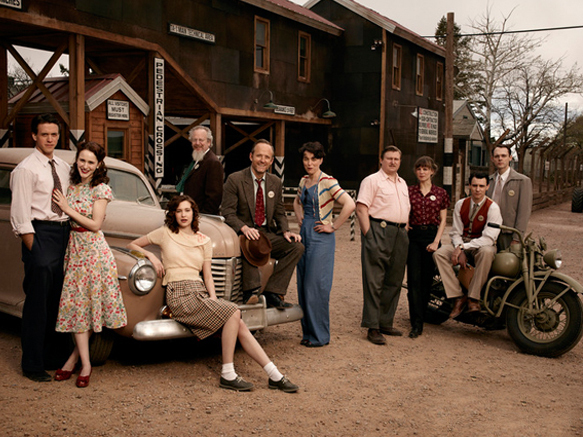 The cast of “Manhattan”, including Ashley Zuckerman and Rachel Brosnahan (left and second from left) as Charlie and Abby Isaacs, and John Benjamin Hickey and Olivia Williams (fifth and sixth from left) as Frank and Liza Winter. Finally, the cast (of mostly unknowns, at least to me) is almost uniformly excellent. The actors portraying the main protagonists do a particularly good job in my opinion, but really pretty much everyone in the main cast is spot-on. They’re helped out by the writing; I can think of only a few instances where the combination of writing and actor came off as somewhat cartoonish. Manhattan is by no means a perfect show. A lot of people commenting on the Facebook page take issue with the “soap opera” aspects of the show. Some of this is attributable to the desire of the show’s creators to highlight the human drama inherent in being uprooted from normal life and plopped in the middle of a jerry-built secret city in the middle of the New Mexico desert, especially for spouses and children left behind while the (mostly) men-folk went off to “the Hill” to toil on tasks they couldn’t talk about when they came back home for the night. Some of it is also due to trying to keep viewers from fuzzing out during the science-y parts, in anticipation of some juicy action and intrigue to follow. As one example, there have been two deaths by gunshot thus far, which is one more than occurred during the entire history of the Manhattan project, an enterprise that employed 130,000 people at its height. These issues keep Manhattan from being truly great in my opinion, but it’s still one of the better shows I’ve seen in the past few years. Tonight is the season finale (at 10 pm Eastern on WGN America, channels 29 and 568 on FiOS TV in Howard County), but if you’re like me you can catch it on Hulu at your convenience. For those interested in reading more about the show, unfortunately unlike many other “prestige” shows Manhattan hasn’t gotten a lot of attention on pop-culture sites. The best sources for commentrary and recaps are at science writer Jennifer Oulette’s “Cocktail Party Physics” blog, the “Science Fact vs. Fiction” section on the web site of Popular Mechanics magazine, and on the web site of the Atomic Heritage Foundation, a nonprofit seeking to preserve historical sites and records associated with the Manhattan project. (The latter is a worthy project to which I recently donated.) The Los Alamos Historical Society also has some interesting material contrasting the show’s vision of Los Alamos compared to the real thing. If you do decide to try out Manhattan I hope you enjoy it as much as I do, and if so we can look forward together to the second season.